You will need a sense of humour for this post, I can think a little oddly at times. I tend to use 6x6 paper pads most of the time, I do however have a number of 12x12 individual papers. In this case, I loved the Carta Bella set so much I ended up with both. 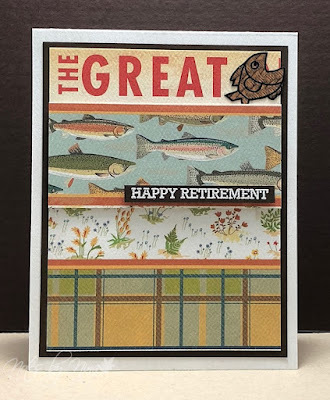 As I was making this card I was cutting a page that had border strips from all the papers it just so happened that for this card the sentiment did not allow for the whole wording. So where it ended was The Big O, now while I am sure that this may happen for some men when it comes to the outdoors and fishing.. if you get my drift. This is a retirement card for my eldest brother and well..... ewww. So I ended up finding a wide-mouthed fish and stamping on a scrap of paper from the same paper set. I have hoped it looks like it may be a well-fed fish or perhaps a fish basket. This was an easy enough card to make, simple layers with a little foam tape tossed in here and there. The sentiment is heat embossed with white embossing and popped up with foam tape. Supplies: White and brown cardstock, Designer Paper - Carta Bella, Open Studio - Wishing you sentiments. One more thing, in my defence at the above confession. I did not realize till the card was finished about the lettering across the top.. clueless really.